captTo get to North Korea, I flew with my group from Uri Tours from Beijing, China. Our first initial meeting as a group was the night before at a restaurant in Beijing, and then most people stayed together that night in Beijing in a hotel. 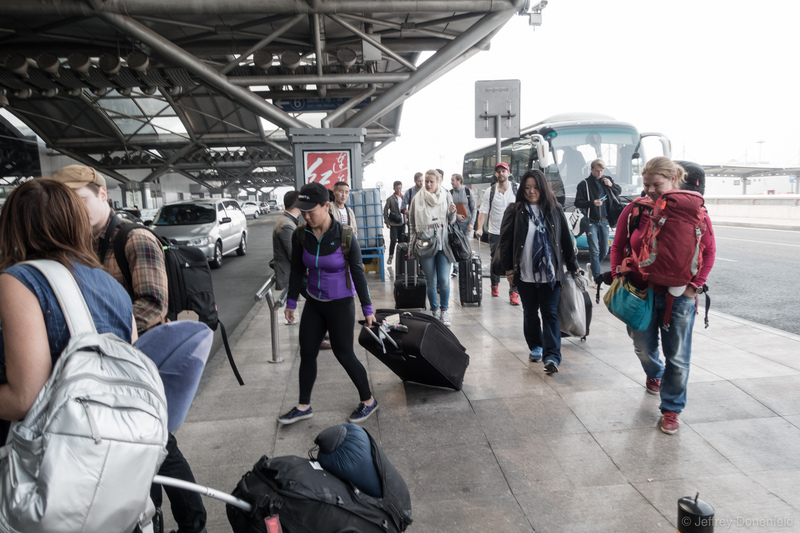 A few more people joined us at the Beijing airport, and by the time the flight was boarding, everybody was assembled at the gate. it's worth noting that this was a six day trip - I typically pack fairly minimally - and I had a 12kg, 40L backpack as my only luggage. I was a bit surprised by how much some of the other tour memebers packed. Lighter the better, I think..
descriTo get to North Korea, I flew with my group from Uri Tours from Beijing, China. Our first initial meeting as a group was the night before at a restaurant in Beijing, and then most people stayed together that night in Beijing in a hotel. A few more people joined us at the Beijing airport, and by the time the flight was boarding, everybody was assembled at the gate. it’s worth noting that this was a six day trip – I typically pack fairly minimally – and I had a 12kg, 40L backpack as my only luggage. I was a bit surprised by how much some of the other tour members packed. Lighter the better, I think..